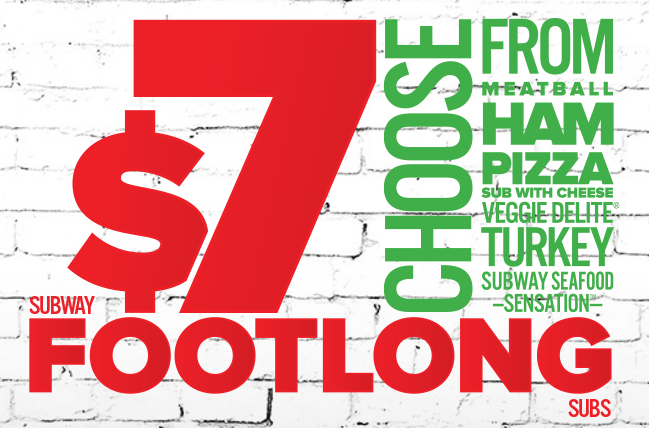 Update: Are you looking for the new $7 Footlong Sub of the Day? For a limited time only, participating Subway stores are bringing back one of their most popular offers – $7 Footlong Subs! Spotted on Ozbargain, we’ve seen comments suggesting its available in Sydney and Melbourne, but not in the Melbourne Airport or Perth Airport stores. Let us know in the comments if you’ve seen it at your store! The deal’s available for a limited time only – so get into your closest participating Subway store to take advantage of this offer! To locate your closest Subway store, click here. Will this apply in Adelaide store? Subway in Collingwood doesn t work..